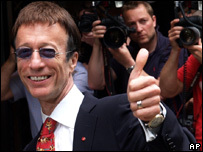 Bee Gee Robin Gibb says he plans to campaign for a change to copyright laws on behalf of musicians in the UK. Currently, performers in the UK receive royalty payments for 50 years, at which point their work goes out of copyright. "Artists should be getting royalties for the records that they make for life," Gibb told the BBC News website. The singer has just been made President of CISAC, a body representing creative artists around the world. Film director Alfonso Cuaron became Vice-President. "I've been a songwriter since I was 8 years old," said Gibb. "I want to champion the rights of all those people who aren't getting a fair share from their creative work." The 57-year-old said the Bee Gees had experienced several periods in their career where they did not control their music - including hits like Massachusetts and Jive Talkin'. The singer said he wanted to make sure other artists did not suffer a similar fate. "We were lucky because we had some good people working on our behalf, but the reality is that many do not," he said. "There are still many major writers who still don't own their catalogue. "It's a moral issue that people should get a bigger piece of the pie." Gibb said his plans included creating a record label for UK artists, giving them easier access to digital download stores like iTunes. Earlier this year, the House of Commons culture committee said people had a "moral right" to keep control of their creations while alive. It recommended extending the copyright term for sound recordings to at least 70 years, allowing performers to benefit from their early works throughout their lifetime. The International Confederation of Societies of Authors and Composers (CISAC) is comprised of 217 organisations which collect royalties and other payments for songwriters, novelists, screenwriters and others in the creative industry. It indirectly represents 2.5m artists worldwide.